Sealing granite countertops yourself is easy! Sealing granite may be critical to making sure your countertops are protected from staining. This article will help you understand granite sealing and determine how well your tops are protected. You’ll also learn how to properly seal granite countertops yourself! Yes, you can easily seal your own granite countertops with professional quality … probably better than your granite contractor or builder provided. Do All Granite Tops Need To Be Sealed? But first, did you know that your granite counters may or may not need granite sealer? “Granites” vary in how porous they are and how susceptible to staining they are. Actually, the color and patterning of your granite can indicate how porous your countertops may be. Should you seal granite countertops in the first place? I believe that sealing granite countertops has become a misunderstood practice and a misused marketing tactic, the result of both ignorance in the countertop industry and maybe even malicious intent. Granite sealer is over-promoted and over-applied. Some stones need it. Some don’t. Should I seal my granite? Granites vary in how porous they are. Some granites never need sealer and should never be sealed. This goes for most black granite countertops which are typically very dense and will neither stain nor absorb sealer. Other stones may need several coats of sealer. Understand that stone characterized as granite has much different needs than marble or limestone (which are calcite-based stones, react to acids, and are typically more porous and subject to “etching”). Make sure you know what your stone is. Test your stone to see if it needs sealer with a Lemon Juice Test. Place a few drops of lemon juice in an inconspicuous place. If dark spots appear quickly, the stone is potentially a problem since it is reacting with an acid. There’s a chance the stone is calcite-based, perhaps limestone, and will be a problem to seal. If the drops take a minute or so to be absorbed, granite sealer can be used to protect the tops. If the lemon juice doesn’t get absorbed at all, your stone does not need to be sealed. Many granite contractors and installers choose to use low quality silicon or siloxane-based granite sealers (that’s if any sealer was applied at all!) Sealers of this type are common in the granite countertop industry and require re-application every 6 months or one time per year. The best granite sealer is fluorocarbon alphatic resin sealer. Unlike silicon-based sealers, these will not evaporate or go through any type of natural degradation. Fluorocarbon alphatic resin is more expensive than lesser quality sealers, but you get what you pay for. And in this case it’s both simple granite care and peace of mind. Quality granite sealers or impregnators are below-surface penetrating sealers, not topical sealers. The sealing substance is delivered inside the stone by natural absorption. Sealer/Impregnator consists of a solid resin (which seals the “pores” of the stone), and a solvent or water “carrier” to deliver the resin into the stone. Note: With calcite-based stones like marble, onyx, or limestone, no matter what sealer you use, you cannot avoid the damage caused by acids. Anyone who tells you differently is not being truthful. Sealing granite countertops is as easy as spray on, let sit, and wipe off. It literally takes minutes. And if you’re using a high quality alphatic resin granite sealer, you don’t need to keep re-applying over the years. As a granite fabricator and installer, we always degrease countertops and give them their final cleaning with denatured alcohol. For daily granite care, see how to clean granite countertops daily. Denatured alcohol, it turns out, does wonders for cleaning granite and cutting through film buildup on your counters. The result is the original shiny surface. 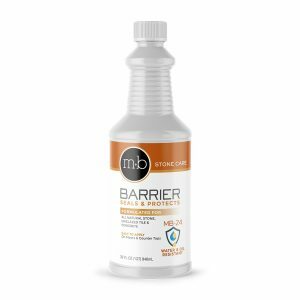 If you apply sealer to a stone that doesn’t need it and won’t absorb it, some sealer will remain on the surface of the stone. Especially with dark color stones, damage may appear such as “ghost water stains” or “water rings”. The granite isn’t stained. In fact, you can consider the sealer is what has created the look of a stain. Don’t seal granite counter tops if they don’t need it. See How To Remove Granite Stains. Sealing granite tables . . . should I seal my granite tables? Here’s a good question: Do granite top tables need to be sealed? If you’re going to place food or drinks on a granite table, it’s a good idea to seal it. As mentioned earlier, dark stone is often more dense and won’t need sealing, but lighter color granites are often more porous and will definitely need to be sealed. Limestone and marble tables should also be sealed to provide some protection. Sealing granite tables is no different than sealing a countertop. Certain habits can eliminate maintenance issues with your natural stone and granite countertops. Use coasters under all glasses, particularly those containing alcohol or citrus juices. Many common foods contain acids that can dull or etch the surface of many calcium based stones. Use trivets or mats under hot dishes and placemats under china, ceramics, silver, or other objects that can scratch the surface. Granite counters don’t usually need the same care as other stones. What’s the best sealer for granite countertops? Should I use special granite cleaner for my countertops? Can I repair a chip in my granite counters? Is Cleaning Granite With UV Light Effective?